This year we are trying something new. We are having Thanksgiving at our house. While most people fret about all the food that they must make, I get nervous about the cleanliness of my home. 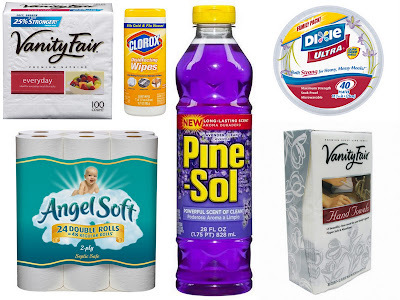 Thankfully, I have a few favorite products that make the chore easy, and you can find all of them at your local Walmart. First, the product I use most year-round are the Clorox disinfecting wipes. I use quite a few of these when wiping down my countertops, scrubbing against the edges of muolding, and when getting the greasy fingerprints off switch plates and the front my fridge. I love the smell of this product; it truly is my favorite. For when a wipe won't cut it, I turned to the Pine-Sol. Just like my mom used to use, this product makes the whole house sparkle and smell fantastic.The new upgraded scent is reminiscent of fresh lavender. I dilute this with water and fill reusable spray bottles to keep in every room. Cloth napkins are fancy, let's get real... I'm not likely to put them out for guests this year, or any year. Instead, I go a little bit more high quality with paper napkins. Vanity Fair does a super job of keeping hands clean and adding a bit of elegance to the dinner table. They even have disposable hand towels for the bathroom. Finally, I offer a solution for those of you who hate to do dishes. Even if you have been blessed with a working dishwasher and plumbing system that supports it (unlike us), you might rather enjoy the company of your friends and family instead of washing up. For these instances, I recommend Dixie Ultra plates. They don't bend, break, or leak, and they look okay on that fancy dinner table. Do you have an arsenal that you turn to when you have company? I'd love to hear what products you depend on to make your home clean and inviting! *I am a participant in the Walmart Moms program. Walmart provides me with compensation for my time on specific projects. Participation in this program is voluntary. As always, all opinions are 100% my own.